If you use Gevent, you know it’s great for concurrency, but alas, none of the Python performance profilers work on Gevent applications. So I’m taking matters into my own hands. I’ll show you how both cProfile and Yappi stumble on programs that use greenlets, and I’ll demonstrate GreenletProfiler, my solution. I’ll write a script that spawns two greenlets, then I’ll profile the script to look for the functions that cost the most. In my script, the foo greenlet spins 20 million times. 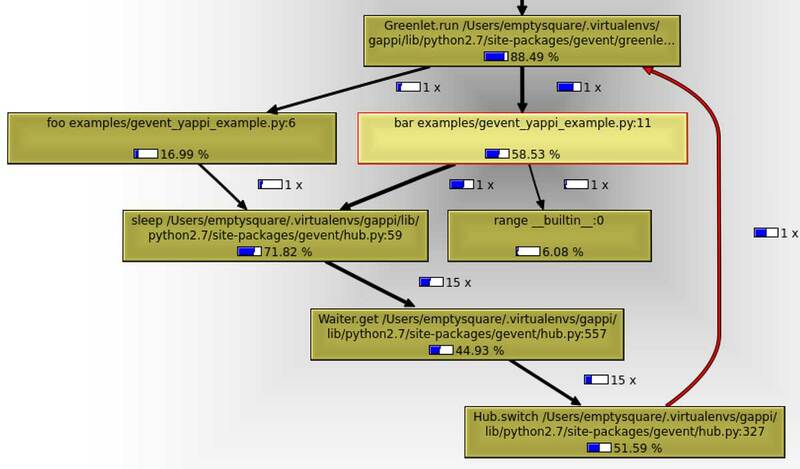 Every million iterations, it yields to Gevent’s scheduler (the “hub”). The bar greenlet does the same, but it spins only half as many times. # Yield to the Gevent hub. cProfile also fails to count the calls to sleep. I’m not sure why cProfile’s befuddlement manifests this particular way. If you understand it, please explain it to me in the comments. But it’s not surprising that cProfile doesn’t understand my script: cProfile is built to trace a single thread, so it assumes that if one function is called, and then a second function is called, that the first must have called the second. Greenlets defeat this assumption because the call stack can change entirely between one function call and the next. This is true in some philosophical sense. When my greenlets sleep, they indirectly cause each other to be scheduled by the Gevent hub. But it’s wrong to say they actually call themselves recursively, and it confuses Yappi’s cost measurements: Yappi attributes most of the CPU cost of the program to Gevent’s internal Waiter.get function. Yappi also, for some reason, thinks that sleep is called only once each by foo and bar, though it knows it was called 30 times in total. Finally, I know which functions to optimize because I have an accurate view of how my script executes. I can’t take much credit for GreenletProfiler, because I stand on the shoulders of giants. Specifically I am standing on the shoulders of Sumer Cip, Yappi’s author. But I hope it’s useful to you. Install it with pip install GreenletProfiler, profile your greenletted program, and let me know how GreenletProfiler works for you.